Rich Kimball and Jim Churchill have more than 53 years of broadcasting experience and they will bring that to a new drive-time sports talk show that will air on Bangor radio station Fox Sports Net AM 910 WAEI beginning on Tuesday, Sept. 6. Kimball, the play-by-play voice of the University of Maine football team, and Churchill, who does play-by-play for the Black Bear baseball team, are the creators of Downtown with Rich Kimball. Their Fandom Productions owns the show and the website, which is sportscentralbangor.com. Fandom Productions will also be adding high school game coverage in the coming weeks. The show will air from 4-6 p.m. Monday through Friday and it will be extended an extra half-hour to serve as a lead-in to University of Maine pregame shows for basketball and men’s hockey. Kimball will host the show and Churchill will be a regular contributor, serving as a reporter and also doing commentaries. 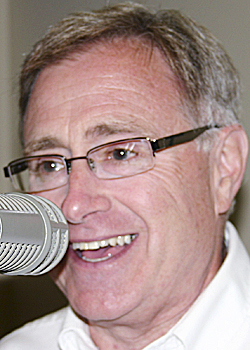 Veteran play-by-play man Pat Spekhardt, who used to co-host a drive-time sports talk show with Jeff Solari on Bangor radio station WZON-AM 620, will be a prominent reporter for the show with a focus on human interest stories. “We will prioritize (our topics) on any given day,” said Kimball, who has been in radio for 36 years. However, the blueprint calls for the Boston professional sports teams to be the top priority followed by the University of Maine teams and high school sports. Kimball would like to pattern the show after the Tony Kornheiser Show. Kornheiser’s credentials include his own radio show, a sportswriter and Washington Post columnist, a former Monday Night Football commentator and the current co-host of ESPN-TV’s Pardon the Interruption with Michael Wilbon. “I miss hearing Tony Kornheiser’s radio show and smart sports talk. That’s our goal with this,” said Kimball. He will call on contacts and acquaintances like Steve Martin, the broadcast coordinator for the NBA’s Charlotte Hornets; Gary Thorne, a multi-sport ESPN play-by-play man and the TV play-by-play man for the Baltimore Orioles, and Comcast SportsNet host Gary Tanguay. All three are Maine natives who got their starts in the business in Maine. Kimball pointed out that he hired Tanguay for his first radio job at WABI when Tanguay was a college student at the University of Maine. “We’ve already got people on board to help out,” said Kimball. “We have a pretty good relationship with the Comcast guys like Tanguay. Other personalities on the show will be former WABI-TV anchor-reporter Felicia Knight, who was the communications director for the National Endowment for the Arts and now has her own company (Knight Vision), which gives advice on media strategies; Towle Tompkins, a former WABI-TV program manager who writes for the New York Times, and USA Today editor Mike James. Several local sports personalities like Solari, University of Maine hockey play-by-play man Dan Hannigan and Black Bear football analyst Bob Lucy will also be involved. “We have lined up a great list of guests (and regular contributors),” said the 49-year-old Churchill. “My goal is to learn something on every show,” said Kimball, who added that they will also plug in breaking news stories. He is optimistic that the show will be well received. “If you do a smart show with great guests who people want to listen to, people will flock to it,” said Kimball. Bruce Biette, the vice president and chief operating officer of Blueberry Broadcasting, which owns the radio station, agreed. Churchill said Biette and Blueberry Broadcasting’s Bangor operations director Jon Shields have been “great partners” in the venture. One thing it won’t be is a telephone call-in show. “But we will look for listeners’ input through emails and our website,” said the 53-year-old Kimball, a 1976 Bangor High School graduate who is a civics teacher and drama director at Brewer High School. The show will go head-to-head with WZON’s sports talk show featuring Dale Duff and Clem LaBree. The WZON format is almost exclusively sports and listener call-ins are part of the curriculum. “It’s not really going to be a competitive thing because we offer a different product, one that is driven by guests and conversation,” explained Kimball.